Spondylolysis is an osseous defect of the pars interarticularis, thought to be a developmental or acquired stress fracture secondary to chronic low-grade trauma. It is encountered most frequently in adolescents, most commonly involving the lower lumbar spine, with particularly high prevalence among athletes involved in certain sports or activities. Spondylolysis can be asymptomatic or can be a cause of spine instability, back pain, and radiculopathy. The biomechanics and pathophysiology of spondylolysis are complex and debated. Imaging is utilized to detect spondylolysis, distinguish acute and active lesions from chronic inactive non-union, help establish prognosis, guide treatment, and to assess bony healing. Radiography with satisfactory technical quality can often demonstrate a pars defect. 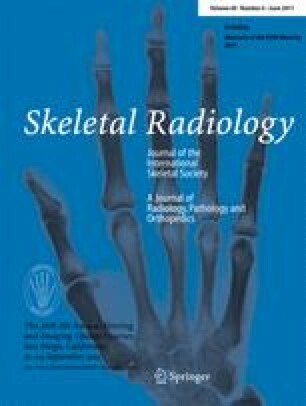 Multislice CT with multiplanar reformats is the most accurate modality for detecting the bony defect and may also be used for assessment of osseous healing; however, as with radiographs, it is not sensitive for detection of the early edematous stress response without a fracture line and exposes the patient to ionizing radiation. Magnetic resonance (MR) imaging should be used as the primary investigation for adolescents with back pain and suspected stress reactions of the lumbar pars interarticularis. Several imaging pitfalls render MR imaging less sensitive than CT for directly visualizing the pars defects (regional degenerative changes and sclerosis). Nevertheless, the presence of bone marrow edema on fluid-sensitive images is an important early finding that may suggest stress response without a visible fracture line. Moreover, MR is the imaging modality of choice for identifying associated nerve root compression. Single-photon emission computed tomography (SPECT) use is limited by a high rate of false-positive and false-negative results and by considerable ionizing radiation exposure. In this article, we provide a review of the current concepts regarding spondylolysis, its epidemiology, pathogenesis, and general treatment guidelines, as well as a detailed review and discussion of the imaging principles for the diagnosis and follow-up of this condition. The authors wish to thank Walter Huda, Ph.D. from the Department of Radiology and Radiological Sciences, Medical University of South Carolina, Charleston, SC, for the “Radiation dose” paragraph text and Table 2 editing. In addition, the authors thank Steven Imbesi Associate Professor of Clinical Radiology from University of California, San Diego Medical Center, San Diego, California, for assistance in editing the manuscript.